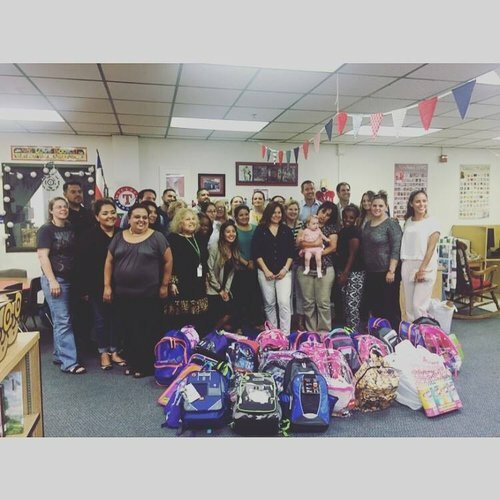 August 2016 - Dallas, Texas – In early August 2016, Oak Cliff-based law firm, Chad West, PLLC, held its 1st annual back to school drive, named “Crayons for Kids,” and sought school supply donations from the Oak Cliff community. As is typical in Oak Cliff, people came out in droves to put together backpacks for children in need, and as a result, the firm was able to fill 50 new backpacks with DISD-requested school supplies. The donations went to James S. Hogg Elementary. The initiative was founded by the staff members of the Oak Cliff Chad West Law team, who during their weekly team meetings, found that the level of children in need of supplies was surprisingly higher than one would imagine. “We’re honored to be the driving factor in bringing the public together to contribute to our neighborhood’s children and essentially investing in the future of our community. The drive has brought a revolving door to our office as locals and others alike have come in and out dropping off bags and bags of school supplies and monetary contributions! It has been a wonderful experience to be a part of something bigger than us,” said firm owner, Chad West. The Crayons for Kids Drive ended Monday, August 15th just in time for back to school registration. Hogg Elementary welcomed the Chad West Law team with big smiles and grateful hearts. The Oak Cliff law firm, which specializes in Personal Injury and Criminal Defense law, continues receiving supplies and donations and making deliveries to teachers and students.